“Magic Wood”. A multitude of natural larch wood slats arranged close together across two strong steel frames give Woodoo its mystical and yet descriptive name. Like a tablecloth, the wooden slats are pulled across the front side of the furniture down to the ground. 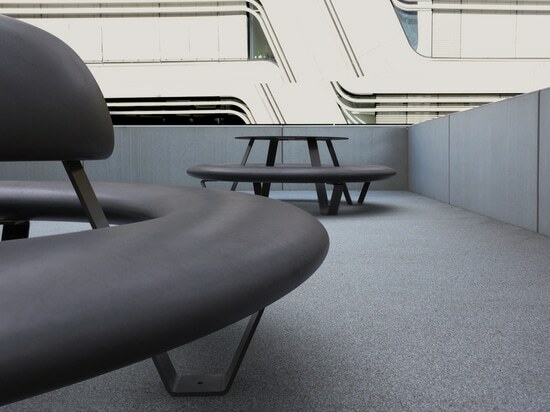 This way, the table-bench combination becomes a large outdoor table that invites people to an extended picnic. The slats are arranged crosswise and invoke associations with a dock - a place of peace and relaxation. Woodoo is therefore a peaceful place on a lively shopping street. The steel parts are hot-galvanised and have a finely structured coating. The colour of the metal can be selected from a small but fine colour palette. Woodoo also meets the needs of older people. The 47 cm seating height makes it easy to sit down and get up again. While developing our furniture, we considered the unfortunate but inevitable topic of vandalism. For the connection of the wood slats to the metal frames, we use special vandalism-proof screw connections. If, however, there should be damage, the short slats can be replaced individually at a reasonable cost.